Being that my car has a hand-built and tuned MINE'S engine with forged components (and not just a new engine installed by MINE'S... I HATE IT when people who've had only that done claim they have a "MINE'S built engine"... yes I'm petty but heck for what I paid!!! ), I've been wanting to "improve" the rest of my car to match. To match the sticker on the rear end (which I found out recently, is not for retail sale from MINE'S). That is, just looking at my car one cannot tell that it has anything that is MINE'S related installed, if the engine isn't visible. So time to change that. 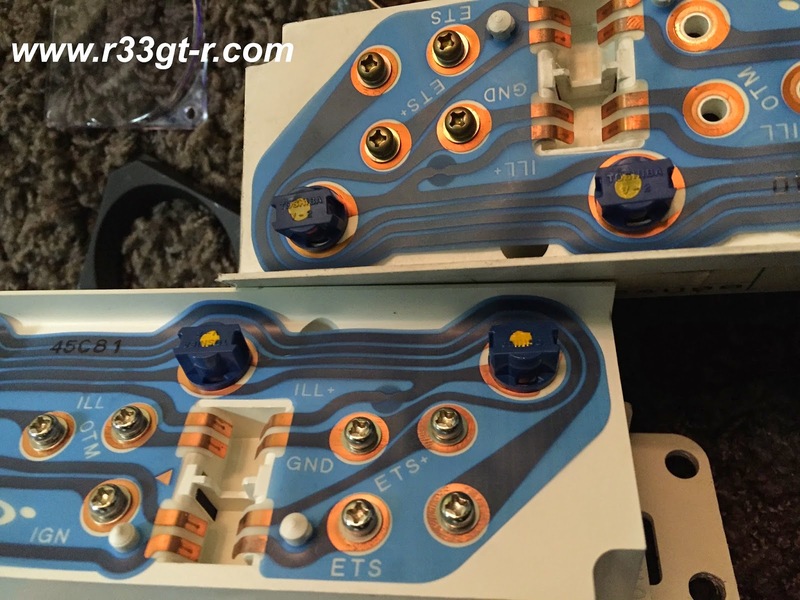 Unfortunately, most parts that MINE'S once made for the 33 are no longer being sold. Or, some of the parts they still offer for the Skyline GT-R, like the brakes and suspension... well let's just say they aren't as cutting edge as they could be. Tower bar, yes it's cool but the one I have is an original NISMO piece. 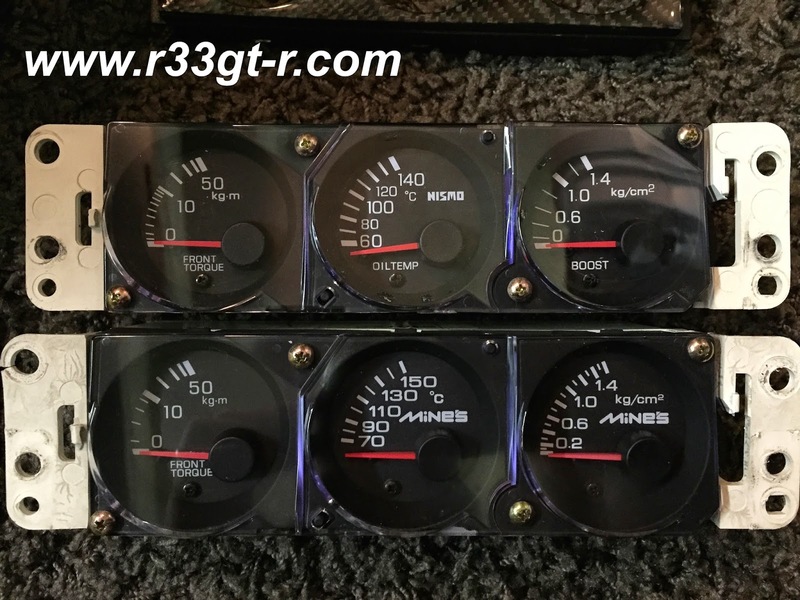 These two gauges are extremely rare - I've only seen them offered on Yahoo Auctions maybe twice the entire 8 years or so that I've been addicted to YA. And, if I recall correctly, for insane money. So I quickly agreed to buy, used PayPal, and the package was on its way to me (it took a few nail-biting weeks, my thanks to the seller's patience when I messaged him every other day!) and I received it just about Christmas time. First order of business was to have the odometer reading changed to match my car's. Not that it really matters too much (in Japan people DO take their cars to dealerships to receive a written work order showing when, and at what mileage, the odometers were swapped out) as I intend to keep the car, but in any case I wanted to have a seamless transition. It took me a few months of research (ok I was lazy), but I finally found a guy that resets odometers to the mileage you want. I won't go into too much detail here, except to say that it works! So I sent it out to him, and got it back two days later, and yes it looked perfect! Alas, it wasn't as simple as this. 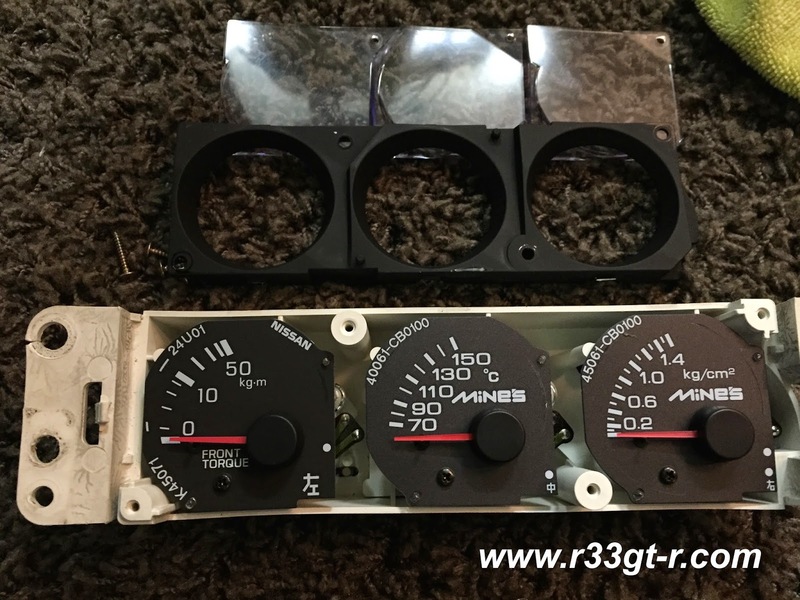 I first had to remove the OEM speedometer from my gauge panel, then remove the MINE'S one from the gauge panel it came in, and swap them out. This is as easy as removing the clear plastic and carbon (or printed carbon) bezel, exposing the gauges fully, and then unscrewing 4 screws in the back. Luckily for me, I found this this shop, DigitechProService, who after a phone call, told me to send the unit to them to see what they could do, but no guarantees. Seeing that I had no choice, I sent the MINE'S gauge cluster to them and waited. 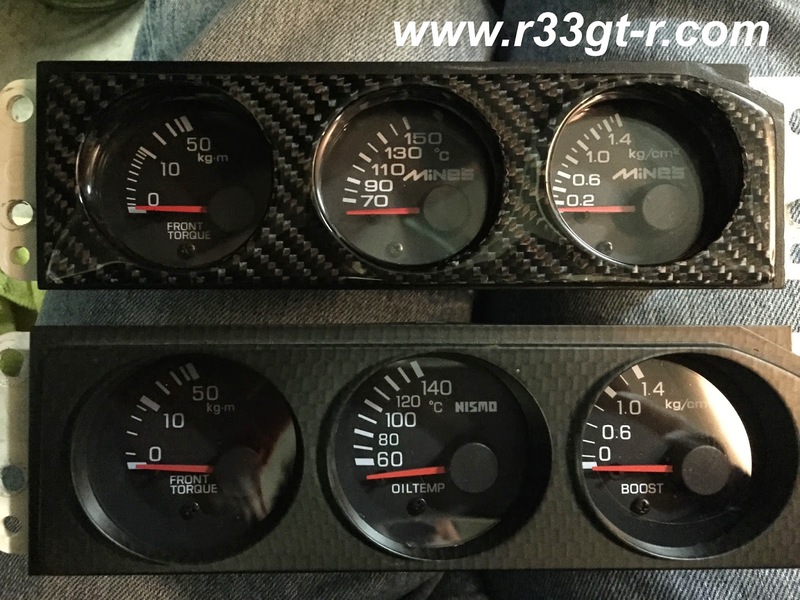 Meanwhile, I went ahead and swapped out the NISMO sub gauges for MINE'S ones. Actually, upon closer inspection I realized that the front torque gauge was an OEM piece, not a MINE'S part. This confirmed that the left most gauge was OEM. 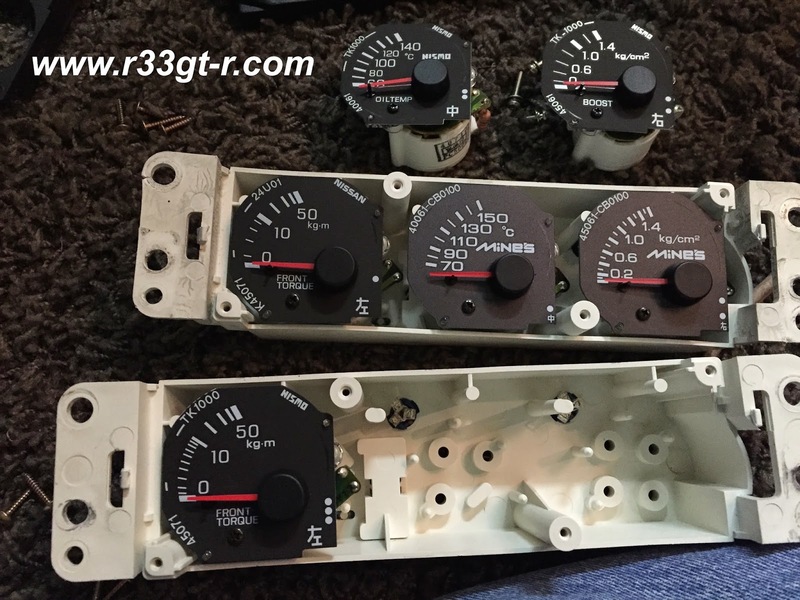 Taking out the NISMO gauges to replace with the MINE'S ones was a bit disconcerting - would they work? This was interesting - the NISMO sub gauge cluster uses stainless bolts, and the Mine's/OEM one uses brass bolts! A few days later, I received the MINE'S main gauge panel back from DigitechProService. 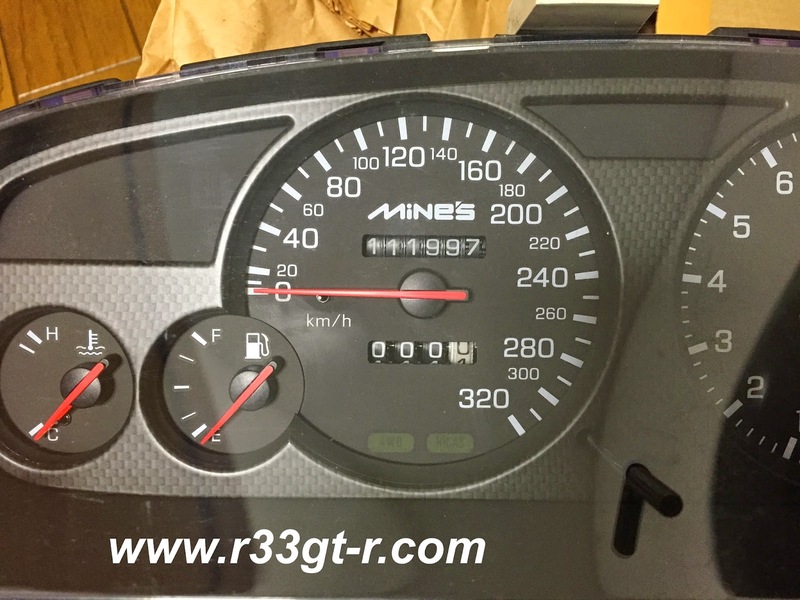 I immediately replaced the OEM speedometer with the MINE'S one (mileage had gone up 28km but they had warned me that this would happen during testing - I actually drove my car around 25km earlier in the day so I am off by 3 km...I can live with this, I think). A twist of the key and... PERFECT!!! Further because I had previously replaced all the bulbs with the "flower" type LEDs, the lighting was also perfect; oh and yes no pinhole light leakage. The sub gauges look blurry but this is due to my iPhone's camera I think. I love this photo! Ok so now I am almost done with MINE'S parts for my car - although yes can someone find me a MINE'S front torque gauge? LOL. You were right, Aki, this post makes it even better! 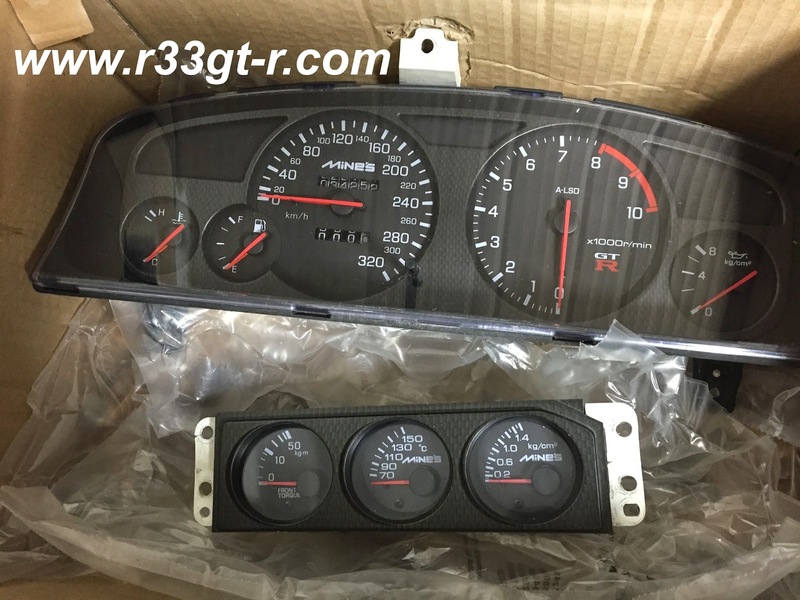 I really like the Nismo gauges but I think I prefer MINE'S gauges as well; I also wasn't aware they made them. At least you can take your car out to 320 KPH on the Wangan no problem! You've also really got my head hurting thinking about what other MINE'S parts you're thinking about, I'm anxious to see what they are. 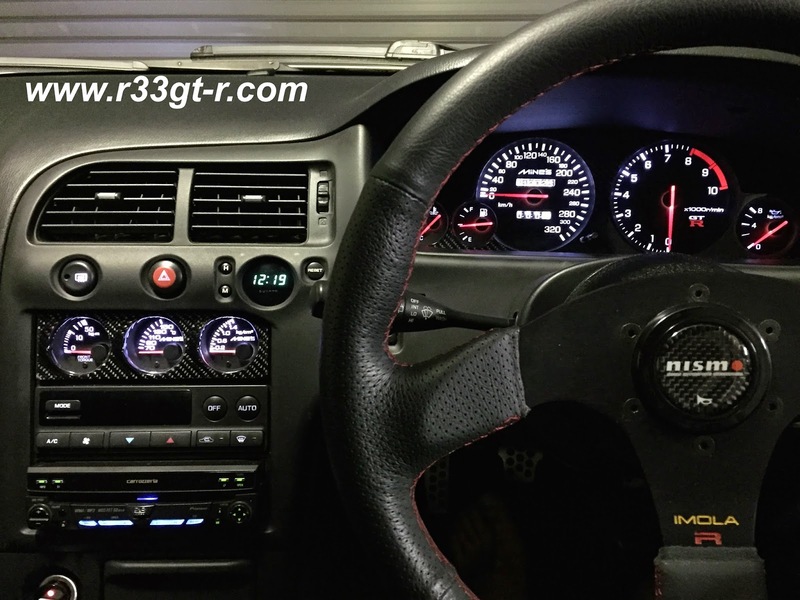 Still can't believe no JDM tuner has stepped up and developed a new combo meter for the BCNR33. 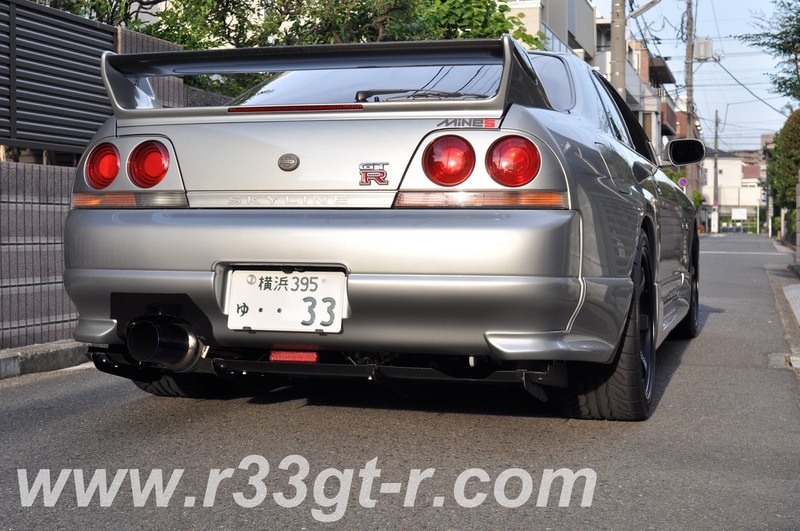 I had to hunt down a used Nismo 320 on Yahoo auctions just because Nismo and everybody else discontinued R33 combo meters. Uh... Zach yeah well 320 KPH isn't going to happen here in Japan either! At least when you're an old dude like me. stj88 - yes it's a shame. But start collecting them now!